Yerba Mate is a green tea infusion from South America that is traditionally drunk with a gourd called mate and a straw called bombilla. The tea is very distinct with a strong natural herbal taste, It has a potent yet soothing kick that will keep you awake and alert and will help you stay focused when you would normally be tired and worn out. It does this without all the caffeine of coffee. If drank properly it is a great dietary supplement, suppressing the appetite while providing you with all the nutrients needed to sustain life, including 24 vitamins and minerals and 15 amino acids. In addition, this South American yerba tea has many other herbal health benefits! t also holds a very symbolic ritualistic tradition around the gathering of close friends, family, and community in that only one gourd - mate is used to serve several people and is usually passed around. Fill 3/4 of the MATE wiyh YERBA MATE. Cover the mate with your hand and shake softly. Till the Mate towards a side. Pour warm water down the emptiest side. Place your bombilla into the empty side. Pour hot water (84ºC, the water must be hot not boiling) over the mate leaves. relax and enjoy your Mate. 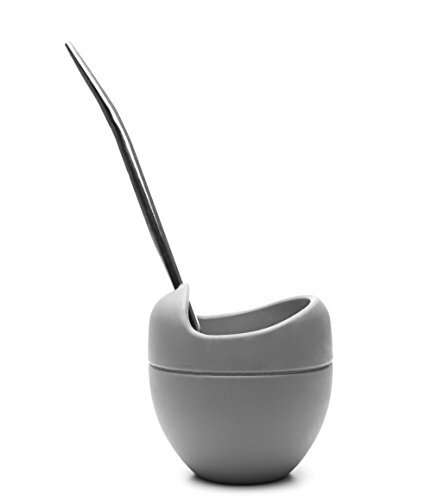 Silicone Mate Gourd with bombilla (metal straw), ideal for new generation of yerba Mate lovers! Unbreakable. Ideal for home, work or travel Mate drinking. The Silicone absorbs the heat from the Yerba Mate, make the silicone gourd comfortable to hold. Does not fix odors so you can add stevia or sweetener. Does not fix bacteria, thermic so it does not heat your hand, dishwasher safe. If you have any questions about this product by Sam&Co., contact us by completing and submitting the form below. If you are looking for a specif part number, please include it with your message.